Good safety practices and good management go hand in hand. We, as tobacco producers, realize that at busy times of the year every minute counts. We do not need to be losing time because an accident has occurred and we need to find a replacement worker. We need to remember that ACCIDENTS HURT, ACCIDENTS COST, AND ACCIDENTS CAN BE AVOIDED. 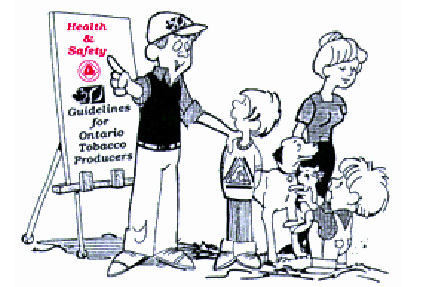 In 1995, there were 166 lost time injuries reported to the Workers' Compensation Board in Ontario from tobacco farms. Many of these injuries could have been avoided by taking the time to ensure that equipment and facilities were safe and that proper instruction was given to employees. "Lack of time" is no excuse to be lax with safety. When we are stressed and preoccupied with the work at hand, safety practices often suffer both on the farm and on the roadways. When we all work together, accidents and costs can be reduced along with your stress levels. The purpose of these guidelines is to remind producers of their responsibility as it applies to the health and safety on the farm. These guidelines will offer reminders of items to consider prior to each operation so that safety becomes a priority. These guidelines will also provide you with references and other sources of information which you may use to comply with accepted safety standards. Examples used in these guidelines are actual accidents, some of which have occurred on tobacco farms. The farm tractor is one of the most used pieces of equipment on today's tobacco farm. Most farms will have more than one tractor, often of different sizes and used for different tasks. It is also the most dangerous piece of machinery you will encounter. Farm tractors have killed 250 people on Ontario farms in a recent fifteen year period. Many of the deaths have involved rollovers to the side or rear, extra passengers falling from the tractor and bystanders being run over. There are a number of basics that you must know about if you are to keep yourself, your family and your employees safe. Setting your wheels at the widest spacing possible for the job at hand. Don't attempt to cross excessively steep slopes. Watch constantly for depressions and obstacles. If stability becomes uncertain on sloping land, turn downhill! Match your speed to conditions and loads. Don't let your tractor bounce. Lock brake pedals together before high speed travel, and slow down before turning. Use engine braking when going downhill. Stay at least as far away from ditches and streams as they are deep. Keep a front-end loader bucket as low as possible. Never hitching a load higher than the drawbar. Use proper weights to increase tractor stability. Start forward motions slowly and increase speed gradually. If possible, avoid backing downhill. Drive around ditches not across them. Back your tractor out when mired in mud. If this won't work, the only safe way is to tow the stuck machine out with another tractor that has rollover protection. 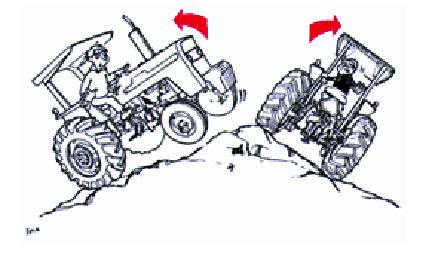 If your tractor has a loader attached to it, lower the loader to the ground when not in use. 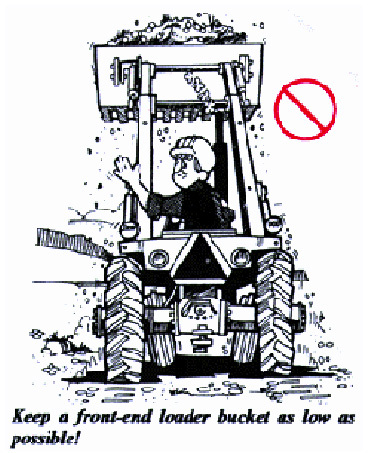 Workers can walk into a raised loader while carrying items or while having vision obstructed. Training new operators thoroughly in tractor operation is a must! Even if your tractor operator has used tractors before, they may have been different makes or models with controls in different locations. 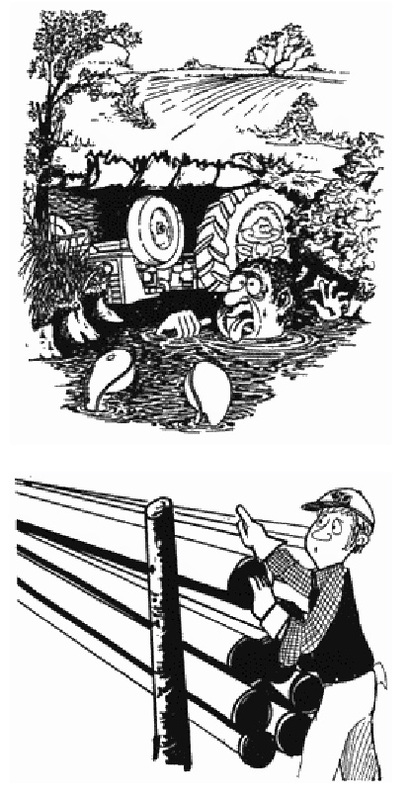 Take the time to review the safety rules and hazards associated with tractor operation. Pesticides are not only toxic to humans, they can be even more toxic to fish, birds and other wildlife. Follow instructions to protect yourself and the environment. When using any farm chemicals you must read the label thoroughly to determine what safety equipment you need for handling, mixing, and applying the chemical. Always follow safety precautions in accordance with the label. 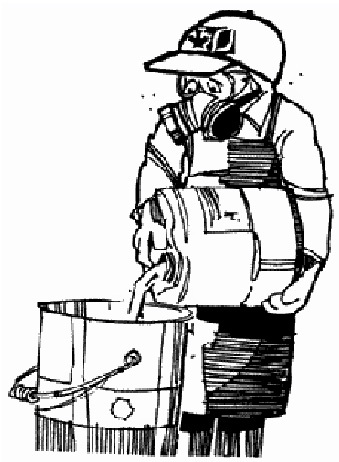 When applying chemicals, wear a respirator if required as well as other prescribed equipment. Pay attention to spray drift and take necessary precautions. Do not apply chemicals when workers are in the fields or greenhouses and observe re-entry times according to label instructions. 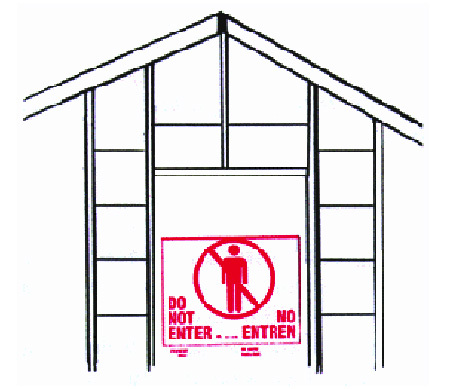 Greenhouses are confined spaces and chemical concentrations can be higher than in open fields. Chemical containers should be triple rinsed with water added to the spray tank. This is because as much as 3% of the original formulation can be left in a container. It could be dangerous to other people if left without rinsing. The rinsed containers should be recycled where possible. Check with your chemical supplier or Ministry of the Environment to determine the nearest drop off site near you. Where allowable, paper or cardboard containers may be burned, ensuring that people and animals are kept away from the smoke and that the smoke is not directed towards buildings, highways, roads or public outdoor areas. 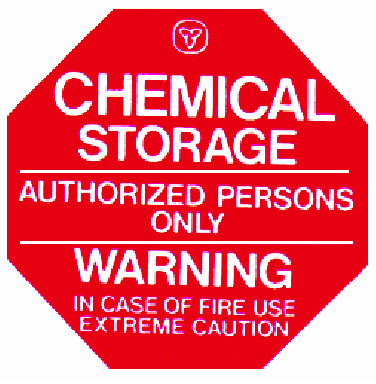 Chemical storage locations must be posted with a warning sign! Chemicals must be stored in accordance with the regulations set out in the Pesticides Act. Chemicals should be locked in a secure storage area vented to the outside atmosphere. A placard bearing the words "CHEMICAL STORAGE WARNING - AUTHORIZED PERSONS ONLY" must be affixed to the entrance. There should be no floor drain that goes into any sewer or water course. Pesticides must be stored in their original containers and off the ground if the possibility of flooding exists. 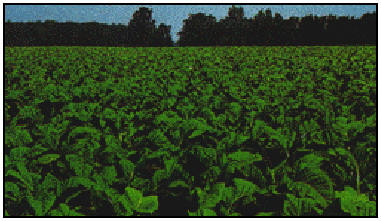 Safety information on farm chemicals is contained in the Tobacco Production Recommendations published by OMAFRA. 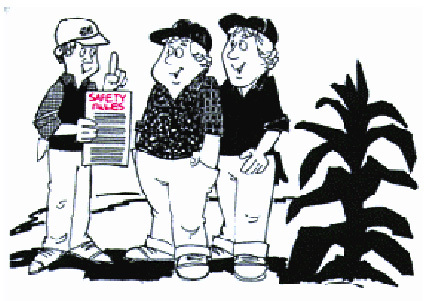 Other safety information is available from your pesticide certification program or the Farm Safety Association. 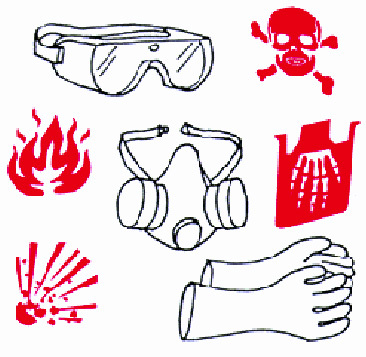 You can obtain Material Safety Data Sheets from your supplier for each chemical when you purchase it. Be extremely careful when working with fumigants. Fumigant gases are highly toxic. When using fumigants wear the appropriate protective equipment to prevent skin and inhalation exposure. When using formaldehyde follow the recommended procedures on the label including the use of proper protective equipment. Formaldehyde is used to control moss and pole rot. Remember that a closed kiln or greenhouse is a confined space! When using formaldehyde to dip sticks make sure that people carrying out this operation wear sufficient protection against splash or vapors. Sprayer equipment should be in top shape. Use caution with high clearance sprayers as their stability can change with terrain, speed and quick turns. These have been known to flip over. For Chemical Safety Precautions in the Greenhouse, please refer to the chemical safety section in this booklet. Replacing greenhouse glass: Gloves and eye protection are a must for this operation. Any ladders that you use should be inspected and in good condition. Housekeeping and cleanup: Make sure that areas in and around the greenhouse are free of debris and other items which can cause hazards. Water lines and pipes: Inspect your water supply lines for wear and tear and replace worn out hoses and taps if necessary. If overhead pipes have created a hazard where employees have walked into them or bumped their heads often, consider moving them higher or elsewhere, if possible. Electrical cords and outlets: Have your wiring checked before starting up. Any extension cords that you use should be inspected and repaired if necessary. Check for cracks in insulation and wear at the connecting ends. Consider the wet environment they will be in. Electricity and water are a deadly mixture. Installing ground fault circuit interrupters in your system is a good safety measure. They could save a life if equipment shorts out. Check the electrical system before start-up. The victim was doing general maintenance when the aluminum ladder the victim was using came into contact with hydro wires. Cause of death was electrocution. 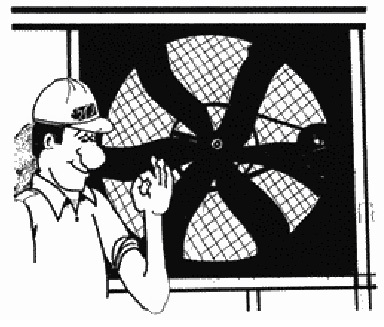 Fans should be guarded: Employees or children should be protected from coming into contact with fan blades. Make sure that some form of shield or guard is in place on both sides of the fan. The mesh on any screen guard should be small enough to prevent fingers from going through and contacting fan blades. Regular maintenance will reduce wear and the noise produced while operating. Use care when steaming with plastic! As you lift the plastic, steam can escape and hit you causing severe burns. Anticipate this, and don't rush! Steamers should be thoroughly inspected: Use caution around steamers at all times. Burns can be common, so use gloves. Cold weather can lead to icy conditions around the steamer. Correct these conditions or slips and falls could result. Check all electrical connections, quick couplers, condition of hoses and pans, gauges and valves. Steam pans and lifters may need maintenance and alignment. Plan your steaming. Ask yourself, what didn't go right last year? Check power floats: Check the electrical system on the power float before work starts. Make employees aware of potential pinch points and place warning decals on areas which cannot be guarded and which present a hazard to workers. All workers should be taught how to reverse or shut off power floats. Make sure that you stop the float before getting on or off. Manually operated floats: Check the condition of the boards, centering, alignment for floats, surfaces traveled on for smoothness, condition of wheels and guide wheels as well as lubrication for easy, quiet use. 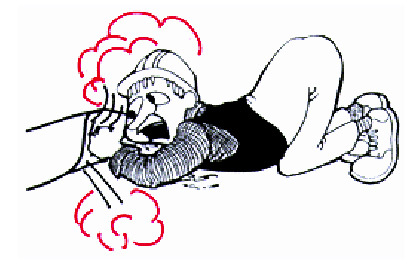 When spreading vermiculite: Make sure that workers are protected with dust masks and eye or face protection. Post warning signs or re-entry times: Post warning signs where you are required to do so according to label instructions of the chemicals used. Store and transport planting chemicals safely! Perform pre-planting maintenance: Carry out an inspection of all equipment and machinery you will be using during planting including planters, wagons, water tanks, tractors, etc. Pay attention to any sharp edges, corners or projections which can cause injury and correct them. 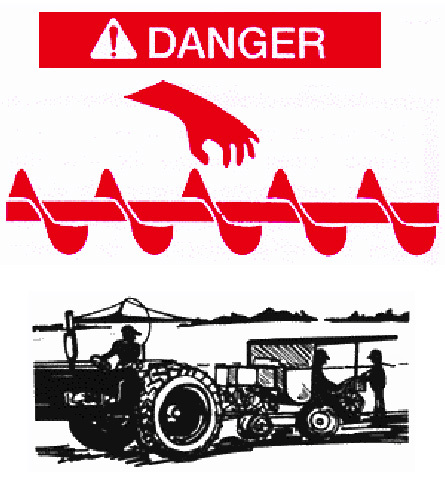 Place warning decals on machinery where hands can become caught in augers, chain drives, belts and pulleys. Proper clothing is a must! This applies to both you and your employees. Dangling scarves, loose long hair, shoe laces, frayed clothing and tie cords can become caught in moving parts of machinery such as planters, and fertilizer augers. Get your signals straight. Communication is very important to safety, especially around noisy equipment. Make sure that everyone knows what signals mean for stopping, starting, etc. Make sure that everyone knows the rules: no one gets on or off of a piece of equipment while it is moving! Watch for bystanders: Before starting to move any piece of equipment, make sure there is no one near it, especially small children who can be run over. Do a quick walk around if necessary. It only takes a few seconds. Ensure that water tanks are secure: This applies to tanks on both trucks and wagons. Check tires for wear and their ability to hold a heavy load before filling the tank. If wagons will be traveling on public roadways make sure they have adequate safety chains and a slow moving vehicle sign on the rear. When wagons are parked, block the wheels to keep them from rolling. Make sure you use safe lifting techniques: Employees should be instructed in safe lifting techniques to prevent possible back injury. When lifting plant boxes or fertilizer bags, bend at the knees and use your legs for lifting...don't stoop! Turn your feet before walking, don't twist with your lifted load. 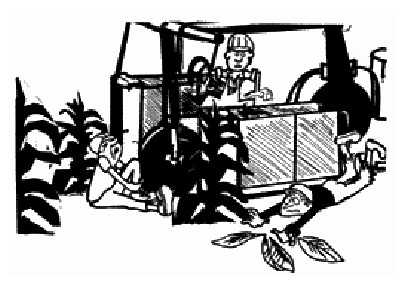 Use team work: assign specific tasks to each worker for re-filling planter with plants, fertilizer, water, etc. An organized team operates more efficiently and safely! When handling fertilizers consider wind conditions before filling the planter. A dust mask and eye protection may be appropriate. A supply of fresh water should be available for washing or to use as an eyewash if needed. Use caution when operating fertilizer augers. The victim had been working on a planter. Upon finishing the row, the victim went to the opposite side at the rear of the machine, and could not be seen by the operator. As the planter was backed up, it knocked the victim down and its wheel passed over the victim's entire right side. Tag your equipment if parts are worn or need to be replaced before next season. These tags act as reminders to fix it before using it. Remember, breakdowns cost time and money! Is your pond fenced? : If your farm pond is easily accessed by the public or if small children can wander near it, you should consider some form of fencing which will prevent a tragedy from occurring on your farm. Machinery access to ponds, or creeks: Some ponds or creeks are located in areas where it is difficult to get machinery in and out. If possible, try to design a safe access point, particularly if employees or contractors will be operating the equipment. The victim was operating a farm tractor and while reversing, drove over the edge of the bank and into a pond. The victim was pinned underneath the tractor in the pond. 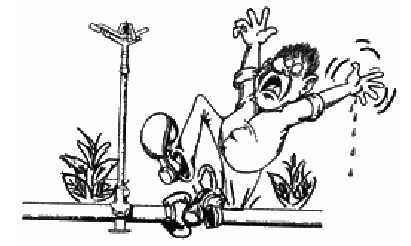 Inspect all pipes and irrigation equipment: This should be done prior to using it. Gloves and work boots are a must for handling pipes. Use caution when moving or raising pipes -- always look for overhead powerlines to prevent electrocution. The victim and another person were laying irrigation pipes from one farm to another. They were attempting to put a 30 foot pipe into a culvert under the road. Since the culvert had filled with sand they kept pulling the pipe out to clear the sand. While doing this, the pipe came into contact with a 4800 volt hydro line and electrocution resulted. High voltage power lines: Consider the location of these lines when setting up your irrigation system and determining where water is to be sprayed. 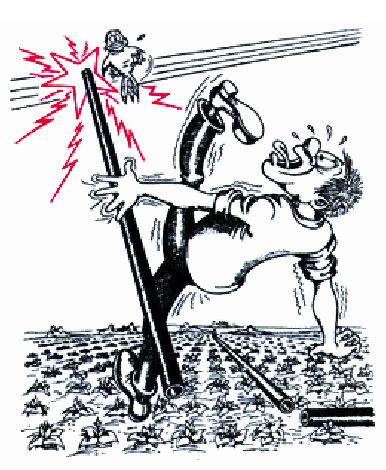 Contact can sometimes lead to electrocution. Pipes loaded for transport should be secured before moving onto the highway. It's the law! For pumps operated by a power takeoff: Make sure that there is a PTO safety shield in place and this includes the master shield on the tractor. Never, never step over the PTO shaft! 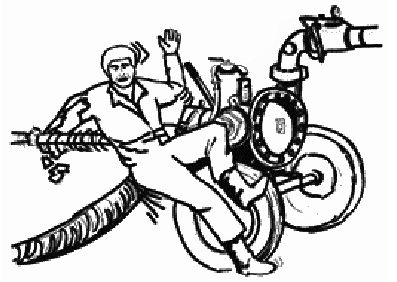 Use caution around 'travelers' or self-moving irrigation systems: Mechanical hazards such as chain drives, revolving shafts, etc., can pose hazards too. Cables on equipment should be checked for wear and replaced if needed. Plan your adjustments and repairs to account for the movement and pressure. When the irrigation head reverses, the force of its momentum can cause injuries. Again, watch for powerlines and use caution around them. The individual was repairing a traveler while it was running and got caught in the system and was killed. Before harvest, perform detailed inspections on all harvest equipment and buildings and make repairs where necessary. Inspect all baskets: Examine both baggy and traditional baskets for broken steel, cracks, and other hazards which can cause cuts or other injury. Shields and guards must be over chain drives, belts and pulleys, etc. Affix warning decals in these areas as reminders to employees. Tobacco rash can be a problem for some workers depending upon their sensitivity. This reaction to contact with tobacco should be treated early. Stress the importance of keeping clothing clean and skin protected to employees. Some have been known to use the same clothing day after day while harvesting the crop. Proper clothing is a must on the priming machine. 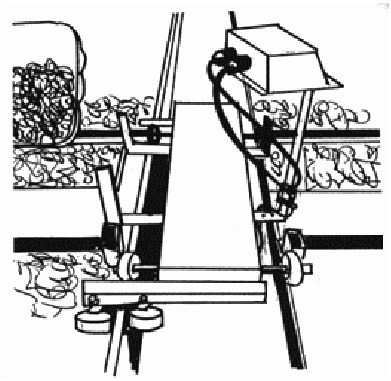 Loose clothing, laces and suspenders can all become caught in moving parts of the machine. Bump caps and proper footwear must be worn. No bare feet! Employees should come prepared with rain suits. Lightning can be deadly. 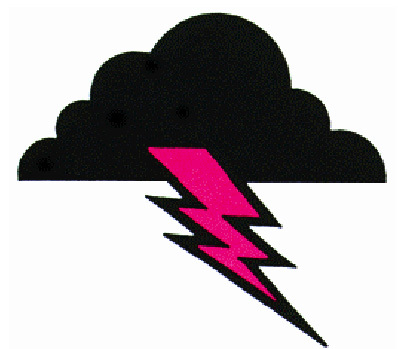 If a sudden severe storm comes up, get away from open areas; go into a building or car. Keep away from water or anything such as metal fences, irrigation systems, etc. If you sense your hair or skin beginning to tingle, you may be about to be struck. Crouch low to the ground with feet together, making you a small target. Do not lie on the ground especially if it is wet. Employees should receive proper job instruction: Explain to your employees how and why something is done as well as the safest way to accomplish the task. Point out that the safe way is the quickest way! Priming machine operators must always be aware of conditions such as ditches. Proper procedures for refueling should be communicated to workers so that an accident doesn't happen such as refueling a hot engine with the potential for explosion. While priming tobacco, the victim's head apparently hit the tobacco priming machine and as a result death occurred due to a brain hemorrhage. Mechanical Harvesters: Both full and semi-automatic harvesters have their own risks. Proper instruction to the operator is critical to safety. Make sure that all employees know that only those people you assign to operate equipment, can operate it. 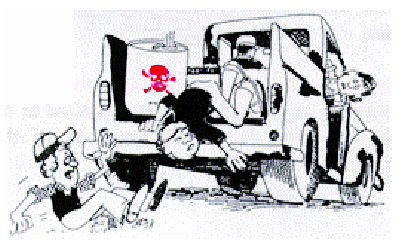 The truck or tractor operator (boat driver) must be constantly aware at all times of conditions, location of bystanders, etc. If the driver is traveling on the roadway with farm machinery he/she must be at least 16 years old. If they are operating a licensed vehicle they must possess a driver's license. The victim was driving a tractor on a highway. A truck came up behind the tractor and attempted to pass. Without warning, the victim started a left turn and struck the side of the truck. The deceased was thrown from the tractor and died later in the hospital of severe brain damage. 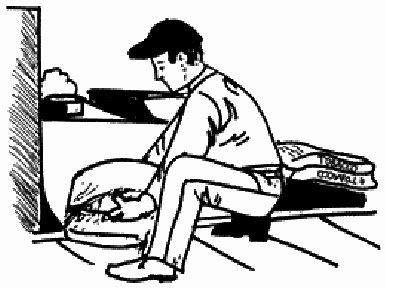 Establish slow down zones for the truck or tractor operator (boat driver) and operators of other equipment in the kiln yard, around buildings, etc. 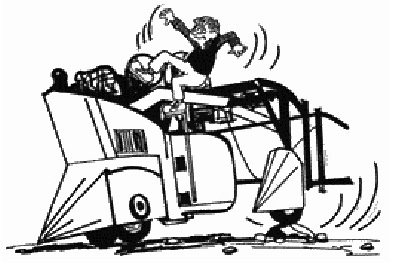 The rule for the driver should be NO RIDERS ON A LOADED TRUCK! Transport workers safely to and from the field. Consider protecting gas meters in the kiln yard to prevent a vehicle from accidentally backing into one or hitting one. The result could be tragic. Use caution when moving ladders around the kiln yard. They can contact power lines and lead to electrocution. Be Aware! The teenager was working with an elevator, lowering it by turning the crank at the side of the elevator. The elevator slipped down and the crank continued to turn, hitting the teenager on the head several times, resulting in death. Check electrical cords and hookups for wear and to ensure that insulation is intact and there is a good ground plug. Use of ground fault circuit interrupters with electrical equipment in the kiln yard is a good safety measure. 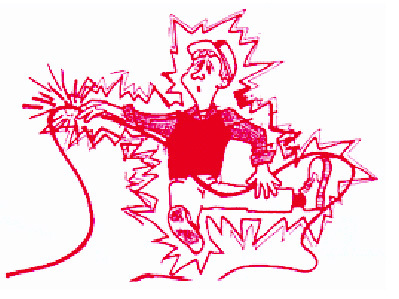 A ground fault circuit interrupter protects you or your employees from potentially fatal electric shock. Wear rubber boots in wet conditions. Check the condition of tying machines: Pay attention to shielding and guarding. The tying machine should always have the wheels blocked to prevent sudden movement which could result in injury while the equipment is operating. When moving equipment such as tying machines, elevators, etc., plan the move, communicate and move slowly. Someone should be placed in charge of moving equipment safely. Conventional kilns should be checked for their condition, especially tiers and kiln hanger boards. It is much easier to replace tiers than kiln hangers. Kiln burners should be serviced and operating properly before they are needed. Check lines for leaks (e.g. oil spots on the ground, pressure gauges for gas). Bulk kilns have their own hazards: Watch for sharp edges on racks and use care when around the pegs which can puncture hands and fingers. Bump caps should be worn when filling the kilns. Equipment which can swivel around should have sharp corners removed or rounded to prevent catching the workers. Any defective equipment at the end of harvest that you will have to fix at a future time should be tagged. This will act as a reminder to you that repairs should be made before using it next year. It is easy to forget. When unloading kilns, safety is a priority. Fast is not always safe! Have dust masks available for employees when conditions require them such as grading sand leaves. Consider anti-fatigue mats on concrete floors to prevent problems created from standing all day. The mats reduce fatigue and sore backs. Safe lifting techniques should be shown to and used by all employees. During the operation of a forklift, it is believed that the victim was not seen by the operator and was run over by the rear wheels. Hot surfaces can burn. Make employees aware of hot surfaces such as steamers and boilers. Hand injuries are common when operating the press. Use caution! It is important to make sure that their living quarters are safe and that they are aware of potential hazards there. Have a first aid kit on hand for workers. Make sure a working smoke alarm is in sleeping quarters. Mount appropriate fire extinguishers, especially near cooking areas. For example, a multi-purpose ABC fire extinguisher. Have Ground Fault Circuit Interrupters installed to prevent electric shock. Have a good ventilation fan in the cooking area. Keep your bunkhouse safe and clean. 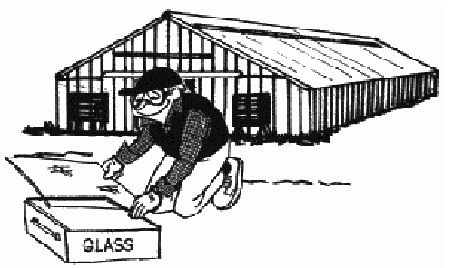 Check with proper authorities for regulations for housing labour on your farm. DO NOT ALLOW HORSEPLAY AT ANY TIME! A safe work environment reduces accidents and thus STRESS at the busiest of times. Keep a supply of extra equipment such as rain suits, boots, etc., for those employees who sometimes forget to bring them. The victim hooked a cable from a tractor driven generator to a junction box at a hydro pole in order to provide electricity to a barn. The victim was found between the tractor and the generator. Investigation revealed that the cable was improperly wired, which allowed power to cycle back to the source through wet ground. The victim was electrocuted by touching either the tractor or the generator. 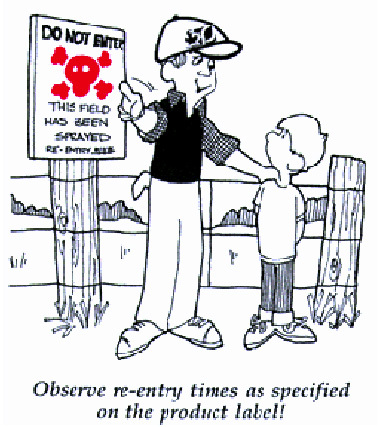 Observe re-entry times after spraying chemicals -- don't send employees into recently sprayed fields. Insist that employees wear proper footwear on the farm-- no bare feet! Keep children away from the workplace! One in five deaths on the farm in Ontario involves a child being in the workplace. Go away from open areas; go into a building, or car/pickup truck. Keep away from anything that conducts electricity. This includes fences, irrigation pipes, water, faucets, appliances, etc. Do not lie on the ground. Crouch low with your feet together to minimize contact with the ground. Don't be the tallest object in an area or anywhere near the tallest object or structure. If you must seek shelter among trees, keep away from the tallest, crouching in a low area or ravine. There is always a need to boost or jump-start batteries on the farm There is great potential for injury if done improperly. Concentrated sulphuric acid can cause severe burns. Eye protection is recommended when boosting the battery. Batteries produce combustible gas. Eliminate potential fire starters. Positive (red) terminal to the dead battery. To positive (red) terminal of the good battery. Negative terminal of the good battery. To engine block of stalled vehicle, away from the battery. Start the vehicle with the good battery first, then start the stalled vehicle. Cables should be removed in reverse order from 4 through to 1. which could cause sparking as a result of electrical contact. Each worker when starting a new job should receive some training for the task that they will be doing. Even those who claim to be experienced at a job should be monitored to make sure that they are doing the job correctly and safely. Explain how and why you want a particular job done. Personally demonstrate how to do the job, the right way. If the job has hazards, make certain that they are pointed out. Before leaving workers on their own, make sure that they can demonstrate to you how to do the your way, and do not leave the workers until you are certain that they will do it right. Make frequent checks on new workers! POST EMERGENCY TELEPHONE NUMBERS by each telephone on the farm. You should include police, ambulance, fire, doctor, hospital, neighbors etc. USE 911 WHERE AVAILABLE. Make sure that you post the FARM LOCATION number where available and the county road, township, lot and concession. You may also want to have a short description of how to get there from the main roads. Remember, in an emergency, it is hard to think straight, and easier to read directions. What do you tell to EMERGENCY PERSONNEL? Describe the emergency in detail and how to get to the location of the emergency. Make sure that you give the telephone number that you are calling from. STAY ON THE PHONE until you are told to hang up. DO YOU HAVE FIRE EXTINGUISHERS in key locations on the farm such as bunkhouse, strip room, workshop, kiln yard, tractors, etc.? Does everyone know how to use them? Has anyone on your farm taken FIRST AID TRAINING COURSES? Do you have first aid kits at work locations? Make sure your first aid kit contains latex gloves, for administering first aid. The FARM SAFETY ASSOCIATION has information on many safety topics and can assist you in developing a safety plan for your farm.